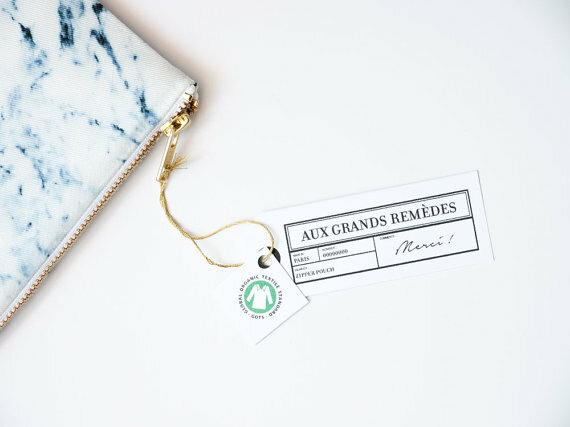 Aux Grands Remèdes – Clutch, pouch and tobacco pouch | Ça bouge dans le 05 ! Enter the Aux Grands Remèdes universe, an original collection which already captured the heart of customers around the world. Thanks to a particular sensitivity to fabric, Louise has been sewing from her youngest age. Inspired by nature (plants, stones, marble, birds…) and exotism, Louise provides an original range of products mostly made of fabric 100% organic cotton twill (certified Global Organic Textile Standard & fairtrade) to guarantee an unmatched quality. Each unique handmade item is designed in her Parisian sewing workshop, located in the heart of the Marais district. The items are made to order and shipped in France and worldwide. To be discovered soon : Her velvet and embroidered creations. Composition : Fabric 100% organic cotton twill. White fabric special lining. YKK zip closure golden metal. Stiffened fabric. Mode: Take by hand or put into a bag. Composition : . Beautiful marble pattern printed onto a twill cotton fabric.White lining synthetic fabric easy to clean. YKK organic or standard zip closure golden metal. Gift idea : Original gift for a assiduous student, a likeable teacher, a funny colleague or just a good friend. Can contain : pens, pencils, brushes, rubber, small ruler, candy, etc. Composition : Cotton pattern jungle, interior natural cotton. Easy storage : Interior pocket for sheets, filters, small lighter or microfilm top secret. Dosage : 1 pouch per tobacco packet. Dimensions : close : 5,5 x 3,9 x 0,7 inch (14 x 10 x 1,5 cm) / open : 5,5 x 7 x 0,4 inch (14 x 17,5 x 1 cm). Depending on tobacco brands, each pouch may contain a 40g packet around. Carefully check the dimensions of your own packet. If you have any doubt, do not hesitate to contact Louise or make a custom request. Tags: clutch, handmade, jungle, make-up, Marais district, marble, paris, parrot, pocket, pouch, sewing, tobacco pouch, toucan. Bookmarquez ce permalien. Pingback: Aux Grands Remèdes – Pochettes, trousses, blagues à tabac | Ça bouge dans le 05 !